Click here to register for a complimentary expo pass. 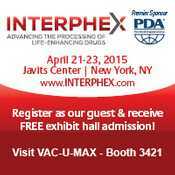 BELLEVILLE, NJ USA (March 4, 2015) – VAC-U-MAX and PalPharma Handling Solutions, a division of Palamatic, formally announce joint exhibition at Interphex 2015, April 21-23, Javits Center, New York, Booth 3421; exhibiting the latest pharmaceutical processing technologies for handling pharmaceutical powders, flakes, soft gels, gel caps, and coated tablets. PalPharma specializes in the manufacture and development of cGMP powder and bulk material handling equipment for use in controlled environments, with product range including post hoists, drum tippers, mobile trucks, vacuum lifters for sanitary environments, in addition to ancillary equipment including sanitary valves, drums and IBC's. VAC-U-MAX specializes in manufacturing sanitary pharmaceutical loaders, receivers, and complete systems for dilute and dense phase vacuum conveying, dilute and dense phase positive pressure conveying, multi-ingredient handling, and batch weighing systems. Together, VAC-U-MAX and PalPharma Handling Solutions provide turnkey pharmaceutical process automation systems and solutions from one source. VAC-U-MAX vacuum tablet press loaders are available in complete, ready-to-operate systems, for mounting on single or dual hopper tablet presses. Constructed from 316L Stainless Steel and USDA accepted, sanitary loaders eliminate the need for manual scooping of product and messy dumping or mishandling. Loader draws material directly from drums, boxes, storage containers, and process vessels at rates of 200-250 kg per hour. Compact design is easy-to-clean with no tools required, offering four quick-acting heavy duty clamps for disassembly and cleaning. Dust-tight connection of receiver to press hopper provides maximum cleanliness and product integrity. Automatic pulse jet filter cleaning ensures peak operating performance. System includes level sensor which automatically starts conveying cycle when material level reaches low level in the tablet press hopper. Unit is powered by air-operated venturi power unit, or high efficiency electric blower, with minimum maintenance – very few moving parts. A full opening discharge valve assures complete discharge of material. Complete package includes: receiver, power unit, vacuum, hose, conveying wand, control panel and mounting lugs for easy installation. VAC-U-MAX sanitary receivers offer the most versatile solution for the handling of free and non-free flowing powders and other bulk materials. Many configurations are available, dependent on conveying applications, including batch weighing, loading tablet press machines, mix tanks, blender, hopper loading, and loss-in-weight feeder refill. All pharmaceutical equipment is constructed from 316L Stainless Steel and USDA accepted, with convey rates ranging from 500 pounds per hour to 5,000 pounds per hour and beyond, with rates varying dependent on material characteristics. Variety of discharge valves types and finishes are available. VAC-U-MAX designs and manufactures pneumatic conveying components and systems for vacuum conveying, batching, and weighing of powders and bulk materials in the food, pharmaceutical and chemical industries. The primary technology for conveying is vacuum, however VAC-U-MAX also specializes in positive pressure systems as well as mechanical conveying. Product line also includes mechanical and flexible screw conveying systems, in addition to a full range of portable and central industrial vacuum cleaning systems for high volume dust, bulk material, or liquid recovery.